Today’s Friday photo is the Administration Block to the former GEC Witton Works, which is grade II listed. 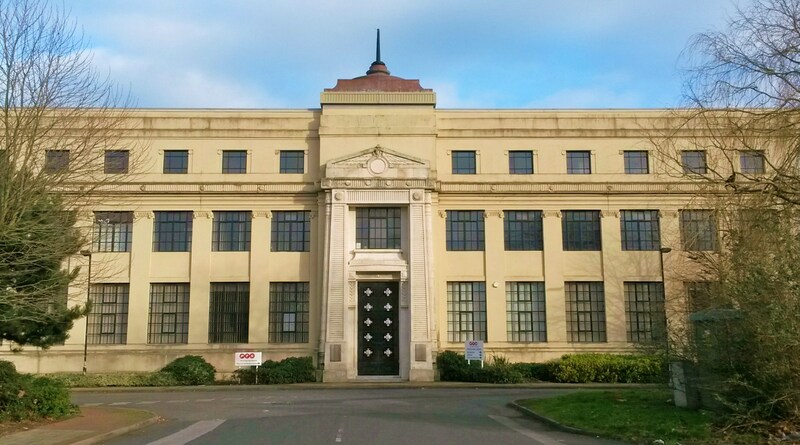 This was built by Wallis, Gilbert and Partners (1920-22) for the General Electrical Company Ltd. Wallis, Gilbert and Partners were the most noted designers of factory buildings in the inter-war period and this GEC admin block is the earliest building by them discovered in good condition. Their most famous work was the Hoover Buildings (1932-5), however, the listing notes that the quality of the detailing of this building is superior. Indeed, the most notable exterior feature is it’s impressive entrance, which according to previous workers was strictly restricted for “managers use only”. Since the company first built a factory here 1902, GEC was a really important employer in Birmingham, over the years it employed thousands of local workers. Indeed, I have several family members who worked in various departments from the 60’s onwards. It’s nice to see that the building is still in a good condition and is still in full use today. My apprenticeship at GEC was the best 5 years of my life ( 1956-1961 ) Transformer division. I emigrated to South Africa in 1974 and they sent me for an interview to a place called Knights in Germiston ——- the company —GEC manufacturing transformers!!! I used to visit this building when it was occupied by GEC Traffic in the late 1980’s early 1990’s. We used to do all the factory acceptance tests on traffic signal control equipment. Although the interior was starting to fall into decay, the fixtures and interior fittings of the building never failed to impress me. The interior doors were huge, made of oak and adorned with heavy brass (bronze?) cast fitments. Does anyone remember a mosaic on the stairwell? The whole building was just stunning. All the engineers used to comment that such a building would never be built again. Sorry if I have missed any earlier posts but has the interior been retained? I no longer live in England (I still miss Birmingham) so I can’t easily visit. Hi Keith, when I looked at the ‘photo of the Admin. block of the GEC Witton, it brought back so many memories. I worked as a secretary under the ‘Dragon Lady’, (now I cannot even remember her name, she was a ‘Miss’ something) in the 1950’s. I have lived in Australia for over 50 years, but remember my time at the GEC very well. I did some maintenance work at her house. I have got a couple of garden stone pots from her house in Sutton Coldfield. Best wishes to all former employees. ‪#‎Birmingham‬ Conservation Trust’s Friday Photo…….GEC Witton Office Block……I worked on this project while working in the Economic Development and Planning Department at Birmingham City Council…..the then owners of the Junction Six Industrial Estate Sir Robert Edmiston’s property development company IM Properties deserve all the plaudits going for saving this building from dereliction by spending £6 million on its refurbishment and conversion to a viable office building for a large industrial unit that they linked to this building……Sadly OPUS Land and their development director Richard Smith were not so ethical when they owned the former IMI works nearby in Witton (now owned by PRUPIM and called #TheHubWitton. It is about to become the site of the new #Birmingham Wholesale Markets complex) when they demolished a similar office building for the IMI Works before the planners could list it…..I recall a beautiful circular building and an imposing office block with a spiral staircase and a green copper roof….I will try to find an image of the building and post it on my Facebook page…..developers making money by getting rid of great buildings is a scandal and should be prevented when the building has architectural merit in my opinion…. Today’s Friday photo is the Administration Block to the former GEC Witton Works, which is grade II listed. This was built by Wallis, Gilbert and Partners (1920-22) for the General Electrical Company Ltd.